NEW ALBANY, Ind. – IU Southeast received a $300,000 grant from the Justice Department’s Office on Violence Against Women (OVW) to aid in the Indiana University Southeast Reduce Sexual Violence and Stalking Project and to be used over a three-year period. OVW’s Grants to Reduce Sexual Assault, Domestic Violence, Dating Violence and Stalking on Campus Program support higher education institutions in implementing comprehensive, coordinated responses to violent crimes on campus through partnerships with victim services providers and justice agencies. The recipients of these grants work collaboratively with local law enforcement and prosecutors, campus athletic programs, Greek life organizations, and off-campus victim services, as each plays a critical role in making campuses safer. “We are honored to receive this impressive grant, and while we are currently ranked as one of the safest college campuses in the nation, we will employ this federal funding to both maintain and improve our on-campus safety record and also serve as a model for other institutions attempting to improve their own student wellbeing procedures,” said IU Southeast Chancellor Dr. Ray Wallace. IU Southeast was selected as the Indiana University institutional nominee to apply for the grant and is the only institution in Indiana to receive it. The grant will be used to fund several initiatives to reduce sexual violence including supporting the county sexual assault response team and providing bystander intervention courses and training for students, guidance counselors, teachers, campus and community law enforcement, university personnel and others. The grant will also be used for the coordination of the annual human trafficking awareness summit with students and community partners, to develop effective outreach to engage specific student populations and to work with community partners such as the Floyd County Prosecutors Office and the Center for Women and Families. 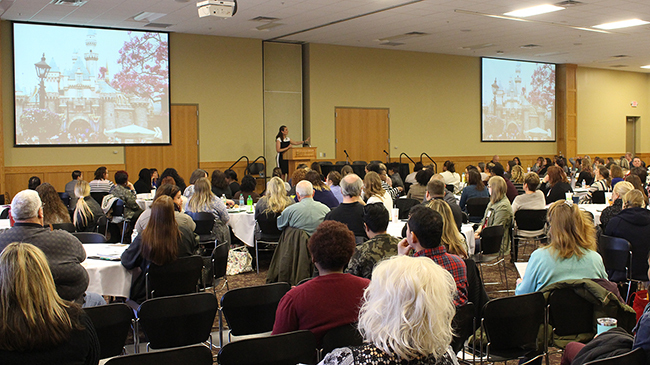 Survivor and activist Jessa Dillow Crisp addresses a large crowd of attendees at the 2018 Southern Indiana Human Trafficking Awareness Conference.